Simple models. Young colors. Supreme quality. 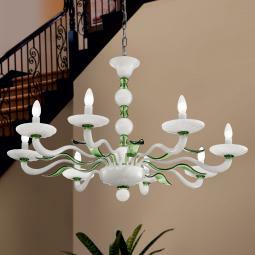 A Murano glass chandelier is that extra touch that will make your home unique! Authentic products handmade in Italy by the Masters glassblowers of Murano. Worldwide shipping, high quality packaging, complete insurance coverage. "Abbondanza" Murano chandelier, hand made by authentic Masters glassblowers from Murano.Made on demand. The dimensions and the colors can be customised to individual specifications.Worldwide shipping and total insurance coverage. 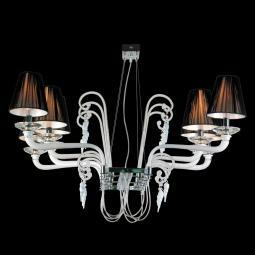 "Tronchi" Murano chandelier, hand made by authentic Masters glassblowers from Murano.Made on demand. The dimensions and the colors can be customised to individual specifications.Worldwide shipping and total insurance coverage. 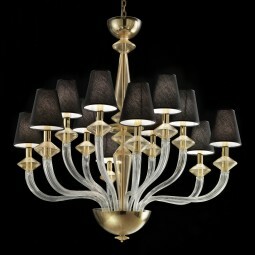 "Solaire" Murano chandelier, hand made by authentic Masters glassblowers from Murano.Made on demand. The dimensions and the colors can be customised to individual specifications.Worldwide shipping and total insurance coverage. 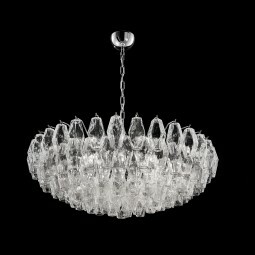 "Keira" Murano chandelier, hand made by authentic Masters glassblowers from Murano. Made on demand. The dimensions and the colors can be customised to individual specifications. Vacuum-packing, worldwide shipping and total insurance coverage. "Manin" Murano glass chandelier, hand made by authentic Masters glassblowers from Murano.Made on demand. The dimensions and the colors can be customised to individual specifications.Vacuum-packing, worldwide shipping and total insurance coverage. "Iris Blu" Murano glass chandelier, hand made by authentic Masters glassblowers from Murano.Made on demand. The dimensions and the colors can be customised to individual specifications.Vacuum-packing, worldwide shipping and total insurance coverage. Wooden crate packing included in price. 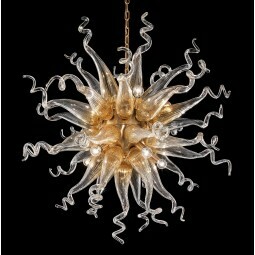 "Hypnos" Murano chandelier, hand made by authentic Masters glassblowers from Murano.Made on demand. The dimensions and the colors can be customised to individual specifications.Worldwide shipping and total insurance coverage. 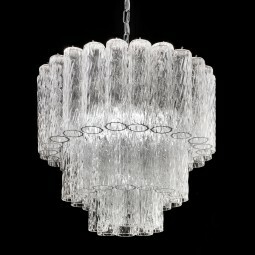 "Giuseppina" Murano chandelier, hand made by authentic Masters glassblowers from Murano.Made on demand. The dimensions and the colors can be customised to individual specifications.Worldwide shipping and total insurance coverage. 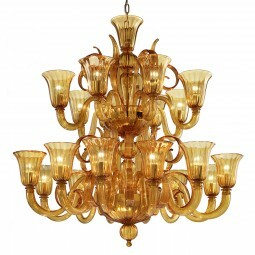 "Altea" Murano chandelier, hand made by authentic Masters glassblowers from Murano.Made on demand. The dimensions and the colors can be customised to individual specifications.Vacuum-packing, worldwide shipping and total insurance coverage. 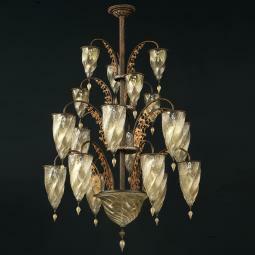 "Henrietta" Murano chandelier, hand made by authentic Masters glassblowers from Murano.Made on demand. The dimensions and the colors can be customised to individual specifications.Worldwide shipping and total insurance coverage. 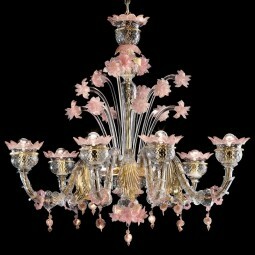 "Gabriella" Murano chandelier, hand made by authentic Masters glassblowers from Murano.Made on demand. The dimensions and the colors can be customised to individual specifications.Worldwide shipping and total insurance coverage. 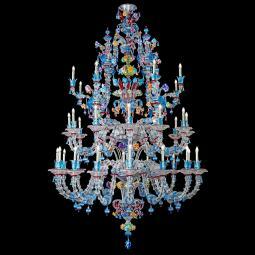 "Diogene" Murano chandelier, hand made by authentic Masters glassblowers from Murano.Made on demand. The dimensions and the colors can be customised to individual specifications.Vacuum-packing, worldwide shipping and total insurance coverage. Wooden crate packing included in price. 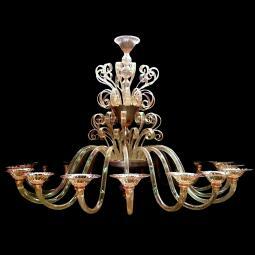 "Alessandria" Murano chandelier, hand made by authentic Masters glassblowers from Murano.Made on demand. Original reproduction of the works of Mariano Fortuny, made with 24K gold and 20K platinum. Worldwide shipping and total insurance coverage. In our store you will find a wide selection of Murano chandeliers, wall lights, ceiling lights, table lamps and floor lamps, all hand blown by Master glassmakers in Venice, Italy. 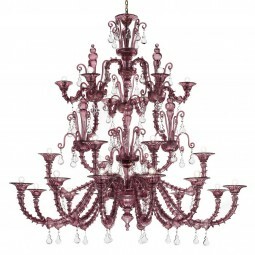 An authentic Murano glass chandelier is a real work of art, and its value is preserved forever. Don't miss this opportunity and give yourself an object for which you will always be envied. We sell directly from the factory and for this we are able to offer truly competitive prices. In this way we are able to offer products of the highest quality at a very attractive price. The most important thing for us is customer satisfaction, and that's why we guarantee a secure payment, fast delivery worldwide and a total insurance coverage. 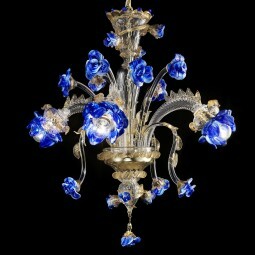 The Murano glass chandeliers have always been considered masterpieces of the venetian art, created following the only possible criterion: the quality. Chandeliers, sconces, ceiling lights, ... everything is customizable in both form and materials: some are glass paste, color "in fogo", chalcedony, opal, aventurine and watermarks. 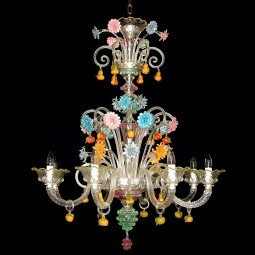 The classic Murano chandelier is made usually by rich colored and festive design elements: the floral metal frame is covered by glass and richly decorated with flowers and leaves in transparent or coloured glass. The sinuous shapes give gentle sensations and reassuring, and instil charming emotions that take you into a magical world of fantasy and dream. Murano chandeliers are not a mere decorative object, but are the subject of a fine creative journey that starts from the study of location and ends with only one possible outcome: unforgettable emotions that accompany you forever every day in your home. Murano is an island in the lagoon of Venice, famous for his glass art. The production of glass lamps and is linked to its history. His name is always associated with the glass, as if they were two synonyms. This union is the result of a thousand years of history, during which the craftsmen of Murano were able to transform the simple sand in one of the highest forms of art. Admiring a Master glassmaker at work while gives shape to the glass using fire, is always one of the most fascinating shows you can attend to. Their gestures may seem simple, but they are actually the result of many years of experience, a real school that is handed down from generation to generation in the furnace. Glass, like almost everything, was discovered by chance, seeing that the sand is fused at high temperatures, becoming glass. It seems that the first to become experts in glass melting were the Phoenicians. Since this technique is widespread in the Middle East and the Mediterranean-Egypt. The ancient Romans brought this technique from the East. The first Italian factory seems to have been founded in Aquileia, an important and ancient Roman port, that was the crucial point in the trade between Europe and the countries of Eastern Europe. After the fall of the Roman Empire to the West and during the barbarian invasions in Northern Italy, the population of the town of Altino and Aquileia sought refuge in the islands of the Venetian Lagoon. The first settlement that later became the city of Venice was founded towards the end of the fifth century in order to escape the incursions of barbarians. It is therefore due to the invasions of the barbarians that Venice developed and gradually began to fill the role that had been of Aquileia. A bridge between the West and the East, based on trade and maritime superiority. Through trade with the East, Venice acquired the ability to assimilate foreign cultures and, with them, their advanced manufacturing techniques. Soon became a rich and powerful maritime Republic, with experienced craftsmen in fields such as the weaving of wool, processing of precious metals and glass blowing. 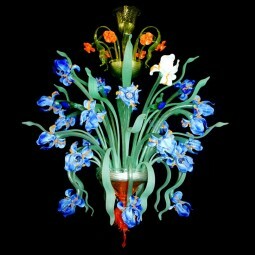 We can say with certainty that the influence of Eastern countries contributed in a fundamental way to the development of glass art in Venice. This is why the Murano glass chandeliers are characterized by their sleek forms and their diverse colors. The glass is no longer something simple and monochromatic, but an art form and an expression of elegance. The first historical documents that certify the working glass in Venice, are dated Ad 982. Up from the year 1291 the Master glass blowers were forced to live and work on the island of Murano. 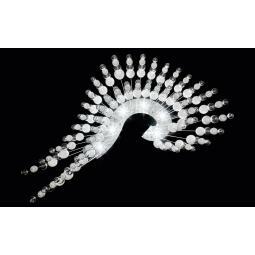 It is since that time that the island of Murano ties its fate to the production of glass. The art of glass processing becomes exclusive in Murano, and creates real dynasties of Master glassblowers, some of which are still active today, since the middle ages. All this makes Murano, one of the oldest still active factories. A historical and cultural heritage to defend and preserve..